In the middle of last week I was expecting an important call. It didn’t come. Then someone said they’d been trying to get me on the phone and couldn’t. It turns out I’ve got a line fault. And OpenReach’s response so far is an object lesson in to how to get things wrong. First off, the fault results in the caller hearing a ringing tone but nothing ringing at this end. This means the caller simiply thinks your not answering. BT’s automated system quickly identified that the line wasn’t working, but I had to ask that callers got an “out-of-order” message. Is OpenReach reluctant to admit that it’s lines could be faulty? The line provides VDSL and an analogue telephone, which goes in to a PABX. Therefore its lack of dial tone wasn’t noticed; the PABX simply skips until it finds a working line when you’re making an outside call. But on plugging a handset direct to the line, it’s as dead as a doornail. No voltage across A-B, no dial tone, no crackle. Nothing. Except, strangely, the VDSL is still working. Now anyone with half a brain will realise that the pair is good, and the fault is going to be in the street box or exchange. My guess is that it’s in the green cabinet up the road where my line connects to the FTTC service. So, several days pass and I notice it hasn’t been fixed. Then I get a call (on one of the remaining working lines) from BT; an obviously foreign accent. Apparently they have determined that there is a fault outside of the exchange (and by implication in my cabling). It’s not with me. The first thing anyone would do is disconnect the PABX and the VDSL modem (and its filter) and test the incoming socket. Just try explaining this to an overseas call centre reading from a script. To humour the hapless fool I eventually I again removed the NTE5 face plate (she didn’t even know what an NTE5 was!) and plugged a handset direct in to the incoming socket. Only then would she agree to send an “engineer” to look at it. I did explain exactly where the fault was likely to be (remember, the VDSL hasn’t been interrupted – it’s not difficult to work it out). Apparently an engineer is now booked for Monday afternoon. I pointed out that he’d need to call me to get access, should it be needed (it shouldn’t) but I’m not sure she took it in. And then, insult to injury, she sent a text message to the landline! I told them about the fault days ago, and exactly what the problem was. It was flagged as fault on their own self-diagnostic. And OpenReach couldn’t even mark the line as out-of-order to callers until I moaned at them. BT makes a lot of money implementing overseas call centres. Yet even they can’t get them to work on a human level. In a move of spectacular incompetence, BT Broadband has hacked the HTTP data stream to customers in order to pop up a message concerning it’s “Parental Controls”. It’s done this without seeking any permission from the customer, and to add insult to injury, the code they’re injecting is buggy. 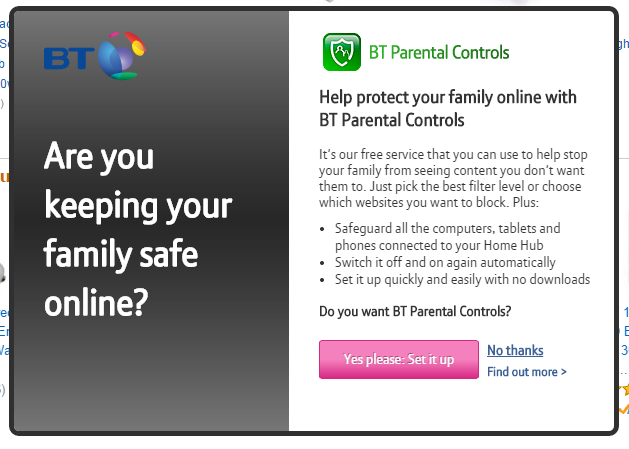 The injected popup says “How to protect your family online with BT Parental Controls”, with an “Are you keeping your family safe?” online in order to worry the ignorant. It goes on “Safeguard all the computers, tablets and phones(sic) connected to your Home Hub”. The “Home Hub” is the weak and feeble excuse for a router they send you “free” when you sign up, and which anyone who knows anything about networking will have kept in the shrink wrap. As you can see from the pop-up above , there is a “No thanks” option, but it simply doesn’t work. Several commonly used websites such as Amazon have become unusable as a result – you just can’t get rid of the BT popup. Even clicking on “Yes please, Set it up” leads you nowhere except to a login to which the credentials are a mystery. Quite possibly because I’m not one of the lusers with a “Home Hub” (or business hub). And this is on a standard Windoze 7 PC running the current version of the Chrome browser. And no software firewall to blame it on. I called BT to complain and ask for it to be removed. They don’t even know what I’m talking about, which is odd because there was a spate of this stupidity earlier in the year. 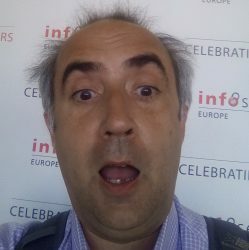 Fortunately they stopped before a full roll-out, but you can’t keep a good idiot now – the same idiot has resurrected the idea and rolled it out, possibly wholesale this time. Whoever it was should be publicly named and sacked.